Here and now, ladies and gentlemen, the review of the game that caused one-thousand seven-hundred forty-eight cerebral strokes and seven-hundred fifty-two heart attacks among members of the "Families of France" association. 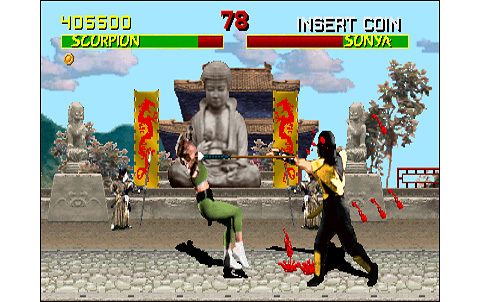 Not to mention the collateral damages... Midway 's Mortal Kombat is the school of life, introducing gore and unhealthy features in the videogame the best way, with the fair single fight on equal terms. 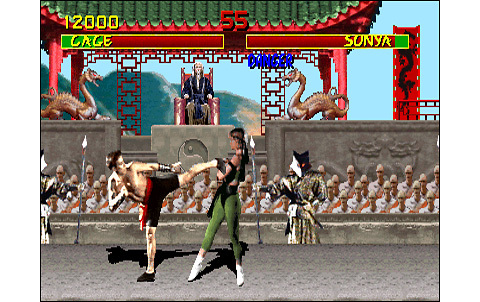 In 1992, Versus Fighting is a genre that grows, and the references in the field are still scarce. Capcom is number one with Street Fighter II, while SNK prepares its response for end of the year, with Art of Fighting and Fatal Fury 2 , two games that will make some noise. 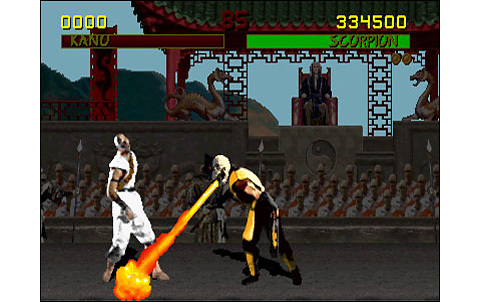 Midway is going to hit hard too, even very hard, with its Mortal Kombat... and touch a lot of players, thanks to some good ideas. The editor clearly chooses not to copy other firms, and provides quite a different game from its competitors. So ok, that's maybe what makes these voices' charm, but we can only deplore the mediocre quality. In addition, the themes are vague and dull, let's say the composition is non-existent and we can hear nothing really memorable! The atmosphere doesn't suffer this anyway, because the game is meant to be dark and unhealthy. MK makes it up with the characters' animation: it's fluid, rich in moves and decomposed. 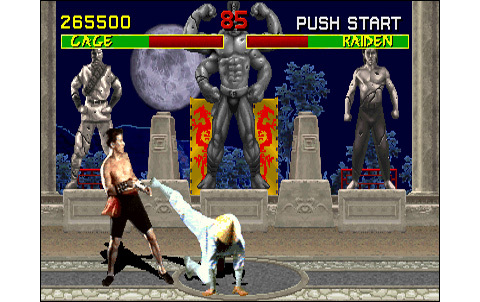 The jumps and some movements are stiff and downright sloppy for some characters - Raiden if you hear me - but the motion capture used here is still remarkable, and the result is nice to see. 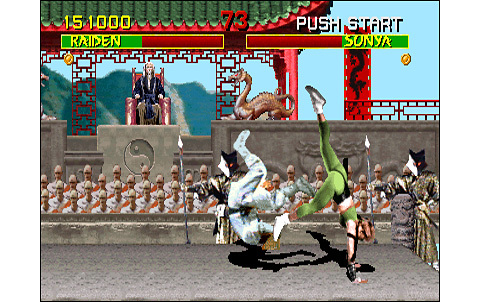 Speaking about gameplay, Midway stands still. Two punch buttons , two kicks and a novelty: a button to block. 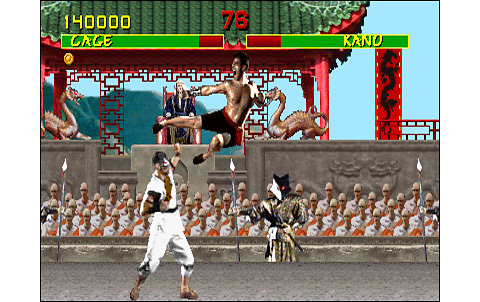 This latest innovation is not too intuitive for those who have learned to play with Street Fighter or Fatal Fury... 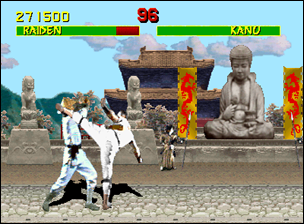 The basic blows are few and various playing techniques limited. 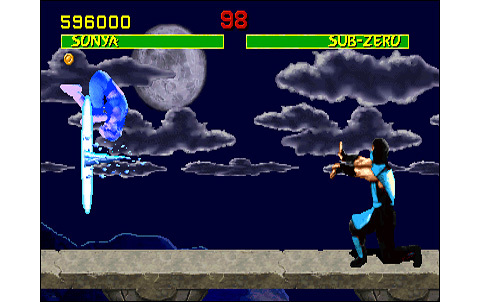 As for special moves, it's also simplistic and generally limited to two per character... 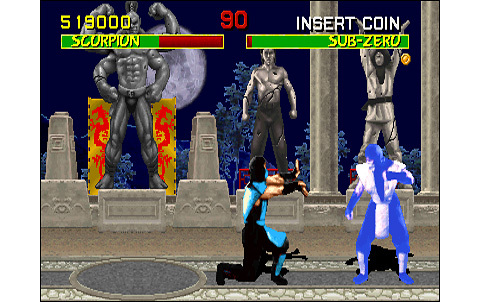 Seven warriors are selectable - eight with Reptile to unlock - while Sub-Zero and Scorpion are very similar, like a Ken and a Ryu. 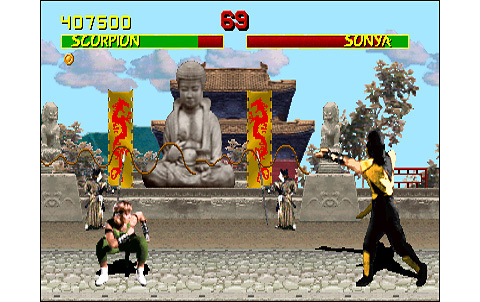 The "Battle Plan" consists of twelve fights punctuated with bonus stages where you have to break wood, stone and even metal... You'll have to defeat all your opponents, win endurance fights against two enemies, and defeat the two Bosses: Goro and Shang Tsung. 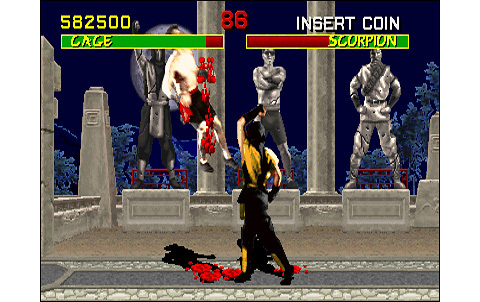 The replay value is good and versus are intense, but make no mistake: in addition to the battle itself, the main interest of this game and what expect all players is to perform the fatalities. 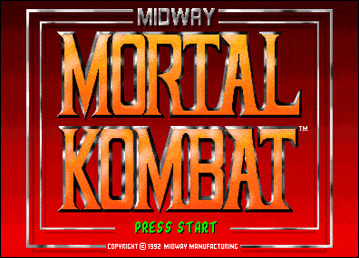 Fun, addictive good... Midway does good, but this is still not enough to make MK a mega-hit with a stainless steel gameplay. 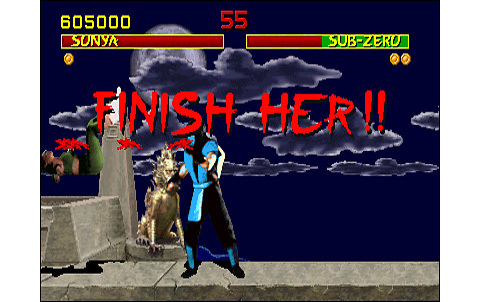 Mortal Kombat is a worthy soft whose next episodes won't disappoint the fans. This number one was among the favorites versus fighting games of players in the early nineties, and it strongly competed with SF2'. Gameplay was interesting and addictive, with an average but uneven realization that has aged terribly. We can only regret that the main interest of the game remains for a large part its gore ambiance and above all the fatalities, rather than a real quality of gameplay and a fantastic realization. Digitized graphics are inequal in quality and dull, moreover backgrounds are not very varied. Nice animation here, decently fast and good decomposition. We can only regret that many characters moves are stiff. Themes are absent and no composition will be remembered by anyone. Sound FX are just above average while vocals are numerous, but sizzling. 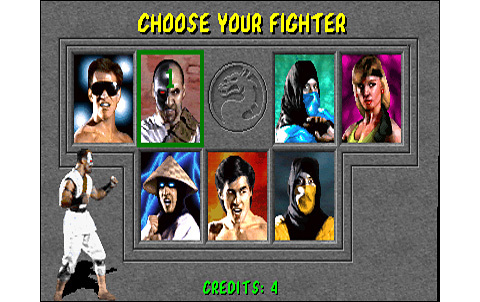 Seven selectable characters, twelve hard battles to win, bonus stages, fatalities to discover... All right! 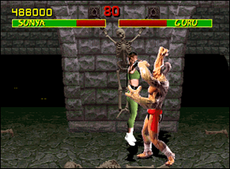 Fatalities are the main asset of the game. 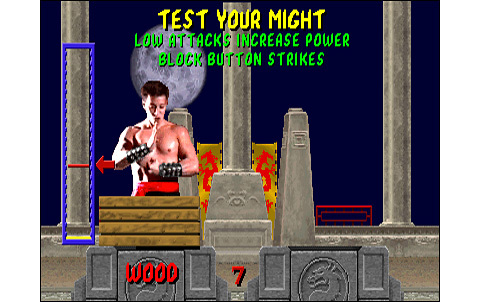 Everything else is not bad, but the block with a button is not intuitive and the game is still not very technical. 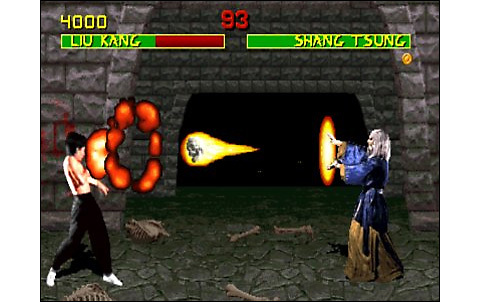 Mortal Kombat stands as a legendary game, but its defects are more visible than ever: poor graphics, kitsch animations, crappy sounds... fatalities and gore standing as the main attraction! 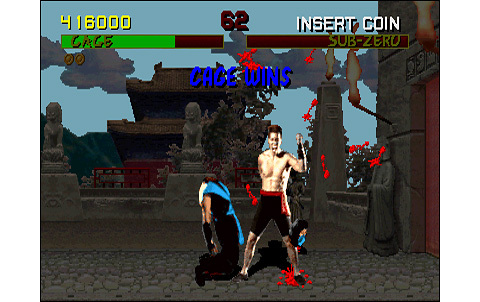 The only VS fighting game with digitized characters released on the SNK system is Ragnagard, in 1996. 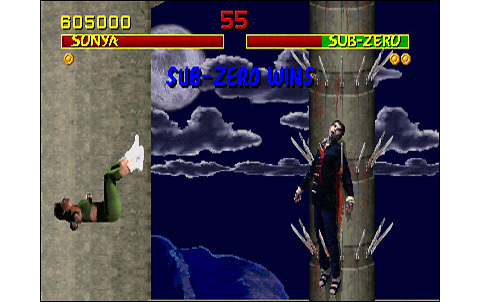 The game is kitsch (for not to say ugly) and doesn't feature fatalities nor gore atmosphere like in Midway's title. 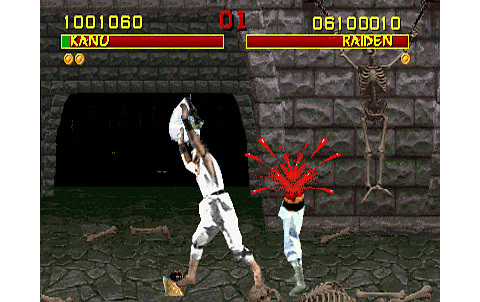 Better choose Samurai Spirits if you want blood! 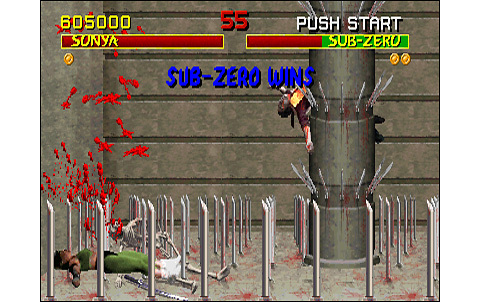 By the way, if you wish to taste fatalities on the Neo Geo, go for Samurai Spirits Zero Special.